As the sun finally sets on the Chipotle empire—one built on two-minute wait times, rice-heavy burrito bowls, and feel-good assurances about ethical sourcing—America looks for a new fast-casual spot to take the reins. I thought ShopHouse was going to improve on the legacy of Chipotle and do better. I was wrong (RIP ShopHouse), and I’ll admit that. But this time I swear I’m right. No, seriously, I got this. Shooters shoot; internet food prognosticators prognosticate. The next fast-casual giant, and the fast-casual giant that we all deserve, is Cava Grill. 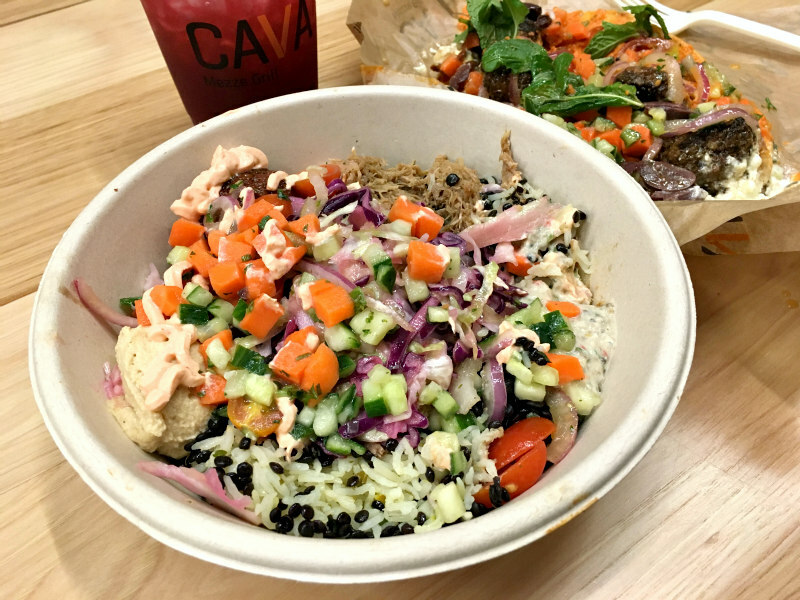 Cava Grill started in the Washington D.C. area and has since expanded to 21 locations around the U.S., thanks to raising $60-million in funding their first year. The only one currently open in L.A. is in Westwood, but three more locations in Culver City, Venice, and Santa Monica are on the way. And you should be stoked about it. Cava took Chipotle’s model and modernized it in every way. When Chipotle rose to power in the late ’90s, America was at the height of Bobby Flay mania in fetishizing Mexican and American Southwestern cooking. Ingredients like chipotle chiles were exotic and in-demand (they’re still in-demand now, but people have a better understanding of, and appreciation for, real Mexican cuisine) and people wanted to experience them within a comfortable setting. 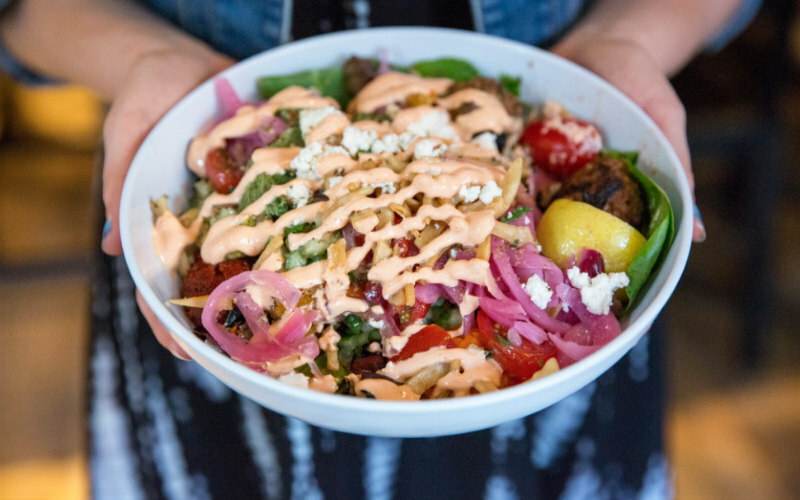 Mediterranean and Middle Eastern flavors are the new safe-exotic that people are pining for. Harissa is the new chipotle, and hummus is the new guac. (Since Chipotle first opened its doors in 1992, hummus sales have increased 14,400 percent, in case you wanted to quantify it). The set up at Cava is similar to Chipotle. You choose between bowls and pita sandwiches then make your way down the assembly line and pick ingredients from a steam-table, all while watching the performative freshness-theater of an employee grilling chicken or chopping vegetables. Cava has more than twice as many options as Chipotle—including premium meats like braised lamb and spicy lamb meatballs—and a selection of six spreads like harissa, roasted red pepper hummus, and some creamy mystery called crazy feta. When you add in the dozen or so vegetable toppings and six dressings at the end of the line, the options tend to get overwhelming, both for the staff and for the customer. But still, at Cava you get that beautiful drunk-with-power feeling that only exists when you control every aspect of your food. It’s a good feeling. 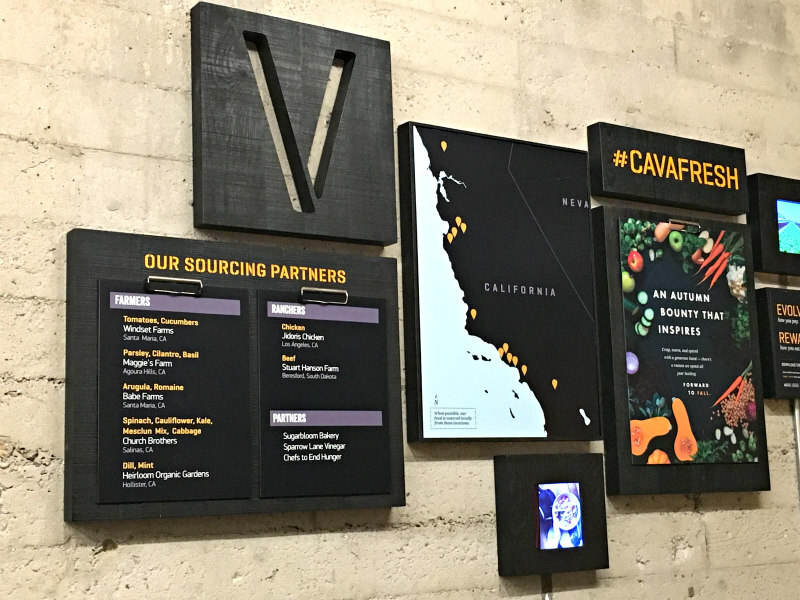 Chipotle may have seduced people with vague language like “food with integrity,” but Cava delivers on that feel-good promise in a real and transparent way. On the back wall of the restaurant, the names of their local partner farms for both their produce and meat are displayed, along with the charities they’re currently supporting. It’s similar to what the salad chain Sweetgreen—another fast-rising, D.C.-based, fast-casual chain—is doing. But Cava should have a broader appeal because they’re making hearty, legitimately crave-able food. 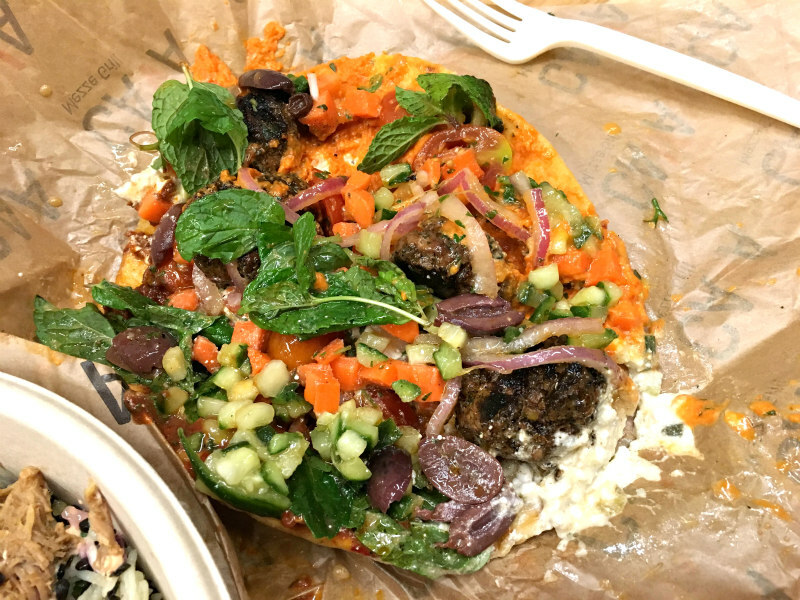 As much as I dig a good kale salad, it’s hard to compete with a spicy lamb meatball pita slathered in harissa, cheese, and pickled vegetables. Chipotle made waves when they announced that all their stores would be going GMO-free—a hard thing to do given that 85 percent of U.S.-grown corn is genetically modified—but detractors made a really solid point: Chipotle still served GMO-laden name-brand sodas. Cava doesn’t play like that. Instead of Coke or Pepsi, Cava’s fountain is filled with a certified organic, fair-trade sodas made by Main Root. 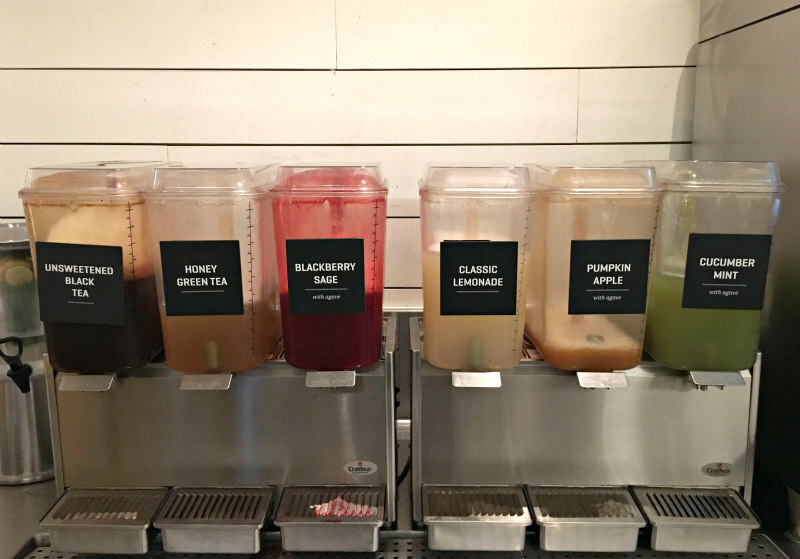 There’s also a row of house-made teas, lemonades, and juice drinks sweetened with agave, which has become a sort of hallmark for the new era of fast-casual spots. Then there’s the issue of labor. Chipotle’s co-CEOs have been roasted by the public for their egregious salaries, and the company itself has been hit with labor lawsuit after labor lawsuit, with the latest one settling for more than $7 million. Who knows how Cava is going to deal with the grittier aspects of running a chain of restaurants when the expansion efforts ramp up, but, right now, their employees’ starting wage nationwide is $13 per hour. And that’s really heartening to see. Cava took the Chipotle model—fast ticket times, exotic-but-safe flavors, infinite customizability, minimalist-industrial design, ethical sourcing—and modernized it in every single way. Let’s hope they can avoid the same fate as Chipotle and not have a spectacular meltdown in 15 years. Fingers crossed! Josh Scherer is the Senior Food Writer at Los Angeles magazine. You can follow him on Twitter and Instagram @CulinaryBroDown. He has a profound emotional relationship with Hot Pockets. Next articleThese Are Some of the Most Powerful Photos from Protests Across L.A.